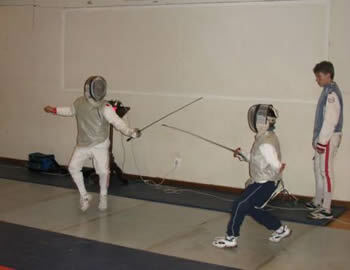 The Fencing Programme at Bishops is outsourced to a professional coach. He has extended the club programme by offering individual lessons after the group practice and this is an exciting prospect for it is really the only way for fencers to master the final points of the game. The scoring system used is the "Italian Relay" method with each game going to three hits with the winning team the first to twenty-seven hits. This system leads to some exciting matches and is ideal for young fencers.